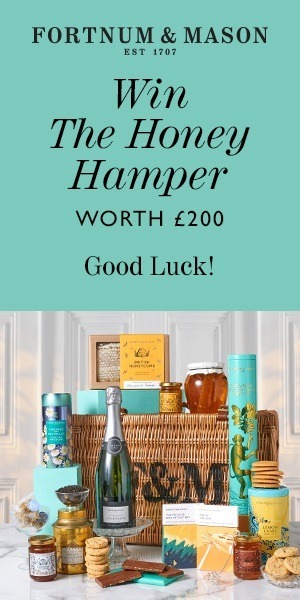 Great British Chefs have teamed up with Fortnum & Mason to give you a chance to win The Honey Hamper worth £200. With three jars of honey, honeycomb, honey-filled chocolate, and more, this is the ultimate hamper for any honey lover. The honey comes from hives from across the UK and is the perfect way to give your breakfast bowl an extra touch of sweetness or to finish your Sunday roast ham with a delicious glaze, elegantly applied with the Swirl Honey Drizzler. Packed for sipping is a bottle of Champagne, and a selection of all natural teas including Chamomile & Bee Pollen Infusion or Ceylon Orange Pekoe infusions – with some tasty, crumbly biscuits to devour alongside.